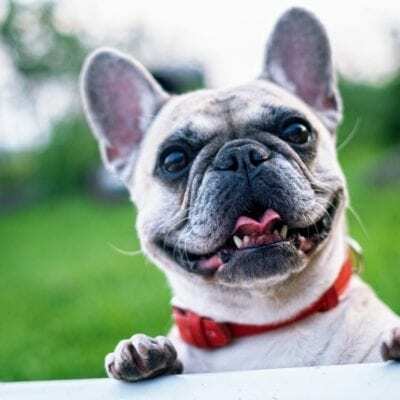 It can be upsetting when your dog doesn’t eat and there is cause to be concerned if your dog all of sudden stops eating or doesn’t eat enough to maintain a healthy weight. This can be scary for new pet parents and even pet parents who are more experienced. However, just like their humans, a dog can lose his appetite. You’ve probably heard of anorexia in people—dogs can also develop anorexia, which is also called loss of appetite. This condition can be caused by everything from stress to illness. 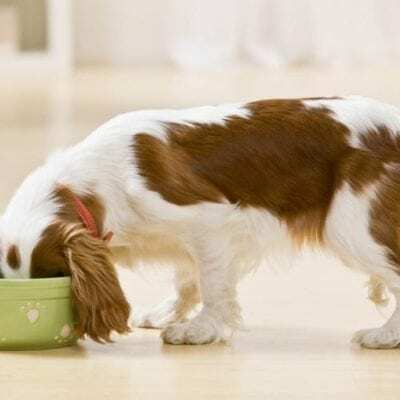 Most dogs eat as much as they can at each meal—this is quite common. But it’s also common for them to lose their appetite and stop eating for a time. However, if your fur baby refuses to eat for a longer period and starts to lose weight, then it’s necessary to figure out what’s going on with your pup and how to get him eating and healthy again. 1). Stomach upset: the first thing to suspect when your dog loses his appetite is maybe he just has an upset stomach. Could he have eaten something he shouldn’t have? Dogs are regularly attracted to things we consider yucky, including trash, dead animals, insects, kitty box snacks, etc. Eating these kinds of things can cause an upset stomach, vomiting, diarrhea and even a distended belly. You may even see your dog eating grass as a way to relieve his stomach distress. You need to be concerned if he doesn’t eat for 2-3 days or if he develops excessive vomiting and diarrhea. If you see these or other troubling signs, then it’s time to call the vet. 2). Dental problems: just like us, our fur babies can develop dental problems that keep them from eating. Your canine companion may have a cavity, a broken tooth, swollen or bleeding gums, etc. Dental problems can make your dog’s mouth or teeth painful, which could make him not want to eat. He may refuse to eat in order to avoid the pain of chewing his food. This may be the case if your dog stopped eating dry food. 3). Medications: any changes in medication could cause an appetite change in your dog. Not only that, but the addition of new medicines could also change his eating habits. When you think of medications, you may envision tablets and pills. However, even injections can have side effects that include loss of appetite. Usually medicines will only have a short-term effect on your pup’s eating habits. It may take a couple of days for his system to adjust; however, if it lasts longer, it will be necessary to let your vet know about this side effect. 4). Boredom: dogs are very similar to us—think of eating the same food every day. Wouldn’t you soon lose your appetite? The same is true of dogs! They can become bored with the same old kibble every day or the same old canned food. It’s a good idea to change it up once in a while to keep your dog happily eating his food. 5). Overeating or overfeeding: both of these are common problems for pet parents and their canine companions. Giving your fur baby too many treats, too much dog food at meal time, or feeding him from the table during your meals can fill your dog up. He may not have room for more food. In fact, he may soon become overweight and develop other health issues when carrying too many extra pounds. 6). Medical problems: certain types of medical issues can cause anorexia in dogs. 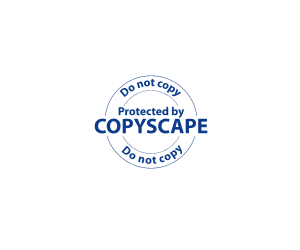 In fact, this is a common symptom in many health conditions. We don’t want to scare you, but disease and conditions such as cancer, infections, problems with organs can cause many symptoms including loss of appetite and even weight loss. 7). Behavioral issues: any type of anxiety, stress, etc. could cause your fur baby not to eat. Changes in their environment such as the death of a loved one, moving to a new home, or the addition of baby or another pet can all cause anxiety and stress. You’ll need to have patience with your pup and may even need vet advice on how to cope. 8). Finicky eaters: some dogs are just finicky eaters. They may want to eat one certain type of food and nothing else. You may suspect a finicky eater if your dog is otherwise seemingly healthy and acting normal. On the other hand, your dog may simply not like the food—this can be the cause of his appetite issues. 9). Teething: puppies sometimes stop eating when they begin teething. When their teeth hurt they may want to avoid eating, which only increases the pain. 10). Pain: your pup may stop eating if he has pain anywhere in his body. You know the pain is severe if it keeps him from eating. Pain can be caused by a wide range of medical issues—everything from cancer, organ problems, to arthritis and hip dysplasia. Sometimes it’s hard to figure out exactly what’s going on with your dog. If his appetite is off for 2-3 days, that’s OK, as long as he’s not having excessive diarrhea or vomiting and there’s no bloody vomit or stools. If he’s still not eating after three days, then it’s time to call the vet and make an appointment. The vet will do a full physical exam and may also decide to run some tests to find out why your dog’s not eating. What if my dog isnt eating but acting normal? The same rule applies—wait for 2-3 days and if he’s still not eating, call the vet. What if my dog not eating but drinking water? If your dog’s drinking water but not eating his food, he could have an upset stomach, a dental problem or some other medical problem. Again, wait for 2-3 days and be sure to call the vet if your pup’s not eating after the third day. Why is my Dog Not Eating His Food Anymore? It could be your pup’s not happy with his food—he’s a finicky eater, or maybe he’s just bored with his food. If you believe he’s bored with his food, you could try to make some simple changes to see if he’ll start eating again. 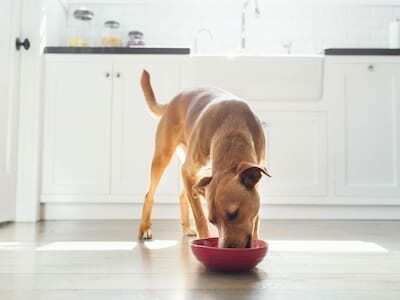 Dogs on a dry kibble diet may respond well to the addition of a meat sauce on their kibble. Try to heat the meat sauce for a few seconds in the microwave, or until it’s warm, but not boiling on the stovetop. Then simply pour this over your fur baby’s kibble and see if he’ll eat. Dogs on a canned food diet may enjoy the crunch of a little kibble sprinkled on top. They may even enjoy some dry cat food mixed in with their wet canned food. Give it a try to see if this will get your pup to eat. Another thing you can try is heating his food slightly. The smell of his food may stimulate your dog to start eating again. Thing about how your own stomach rumbles when you smell your favorite foods! Your dog’s stomach will do the same thing when he smells something yummy! Offer bits of healthy food: such as lean chicken or beef. Liverwurst (which stinks to us, may smell heavenly to your pup) is another option. You can also try peanut butter—another doggie favorite. Avoid overfeeding and too many treats: make sure you’re not giving your pup too much dog food. And avoid filling him with table scraps and dog treats. This way, your dog may become hungry enough to eat his regular food. Appetite stimulants: your vet may determine it’s necessary to give your fur baby an appetite stimulant. This is a medication that works to increase your dog’s appetite so he’ll eat. Treatment of medical issues: if your vet finds a medical problem causing your dog’s anorexia, it will be necessary to treat the condition. Treatment may involve changes in medication, dental work or even surgery. The faster the problem is treated in most cases, the sooner your dog will regain a healthy appetite. However, in some serious cases or in an emergency, your vet may need to use a feeding tube and intravenous nutrients to help your dog’s recovery. Avoid changing to a new food: some dogs don’t eat when they have a change in their food. They may not like the new food, or just prefer their old food. If you decide to make a change in your dog’s food, be sure to do this slowly. You can try mixing in ¼ of a cup of his new food in with the old food, and then mix it together. Every couple of days, decrease the amount of his old food and add in more of the new food. Over time, your dog may adapt to his new diet. It can be scary when your fur baby decides not to eat. The causes of anorexia in dogs can range from dental and medical issues, to your pup being a finicky eater or just having an upset stomach. Watch for signs that your dog is ill and wait about 2-3 days to see if he starts to feel better. If not, then it’s time to call the vet. Proper medical treatment can help get your dog’s appetite back!